IRSHC produces a number of products to assist education in agricultural health and safety topics. While many of the resources are available on this website for free, they may also be purchased in print, videocasette and other media types. 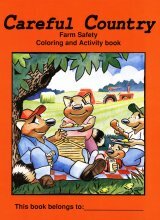 The Careful Country activity book follows the Careful Country farm families: the Racoons, Hogs, Cattle and Dogs. These neighbors interact on and around their farms as they learn about safe practices with farm equipment and animals, safe places and times to play and many others. Includes crossword puzzle, word search and additional resource information. 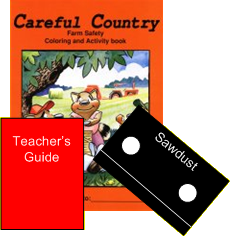 Based on the Careful Country coloring book, this kit contains sample lesson plans, a fact sheet on child farm-related injuries, camera-ready transparency masters, and an 18-minute video, Sawdust, about a puppet who learns safety rules as he dreams of being a real boy. 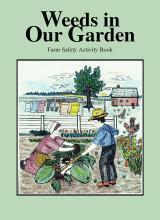 The Weeds in Our Garden activity book was prepared especially with the Amish community in mind. 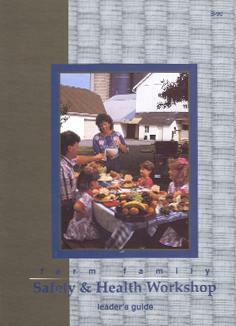 The publication addresses child safety in a Biblical context for use in Amish or Old Order communities. 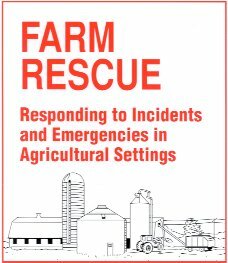 Purpose of this handbook is to help familiarize emergency medical and rescue personnel with the basic principles and procedures for responding to agricultural emergencies. The most common types of incidents are described, and potential hazards to both victim and responder are clearly identified. Updated in 1999, the handbook has 80 pages of valuable information, especially beneficial for rural and volunteer emergency response personnel. This Leader’s Guide is designed to assist individuals in organizing farm safety and health workshops in their communities. The Guide provides insights into obtaining community support for the program and suggests a plan of action for organizing and conducting one. In addition, recommendations for potential resources such as videos and publications appropriate for particular audiences are included, as are instructions for conducting various demonstrations that illustrate the dangers of certain farm activities. The spiral bound booklet contains more than 70 pages of information. 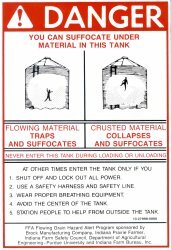 Grain bins on farms can be a death trap. Don’t let it be one for some person on your farm. Post copies of these (peel and stick) DANGER signs on each one of your bins/tanks to warn individuals of the hazards of flowing and/or crusted materials. The sign also lists several safety measures.